SMOK consistently produces devices that many vapers view as THE mods to beat. I have been following the brand closely now for the past few years, and have previously owned a SMOK Alien, a SMOK ProColor, and a SMOK Rolo Badge. 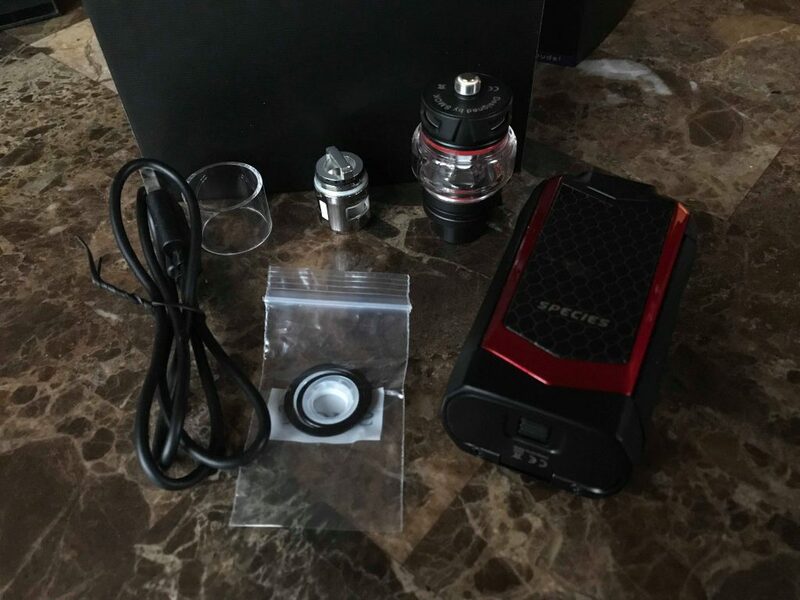 I was sent the new SMOK Species V2 230W Kit for the purpose of this review. I was expecting SMOK’s newest device to operate something like the ProColor, but I was wrong. It’s not just another SMOK kit; it’s a stand-alone package that isn’t just another a cookie-cutter device. 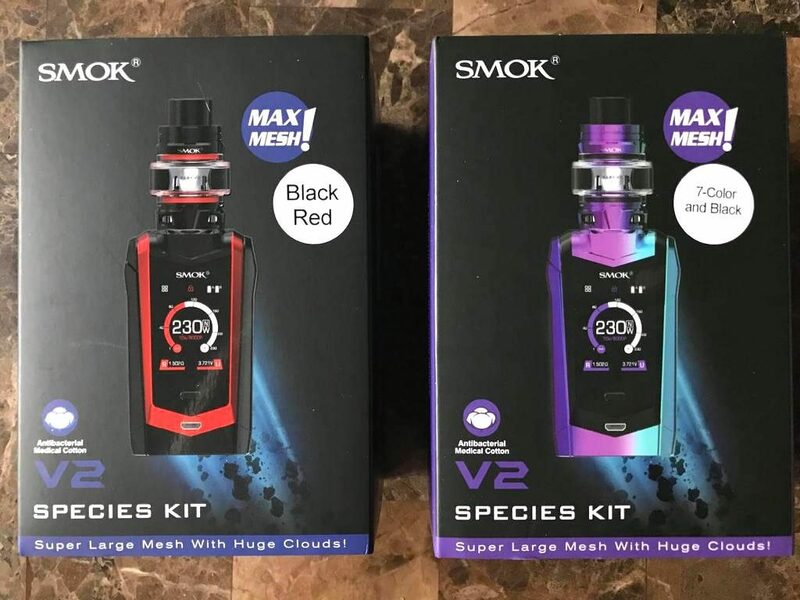 SMOK knew exactly what they were doing when they crafted the SMOK Species V2 230W kit. Not to mention, the Species V2 has an ultra-responsive touch screen that makes operating the device a breeze! I received two different colors of the Species V2 kit. The first one is the black and red. This design is a streamlined look that reminds me of a futuristic spacecraft or—what SMOK was probably going for—an evolved, armored alien species. Either way, the black and red color combo is gorgeously done, with red detail surrounding the black body like armor. The other color combination I received was the 7-Color and Black. The 7-Color is essentially a rainbow. It looks stunning. If you’ve had other SMOK mods with the 7-Color finish, then you know just how cool it looks. 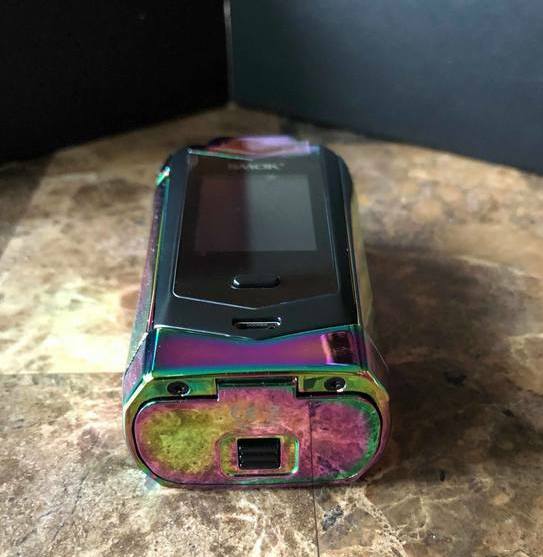 The 7-Color on the Species V2 230W box mod is the main body finish, complemented with black armor around the touch screen and the back face of the mod. The front face of Species mod has a centered 1.45-inch touch screen that steals the show. I mean this screen is integrated seamlessly. It’s set in nice and tight, so you can’t feel any edges (a weird pet peeve I found with one of my other box mods). Below that is a lock button and, of course, a Micro-USB port for charging or updating your mod’s interface. 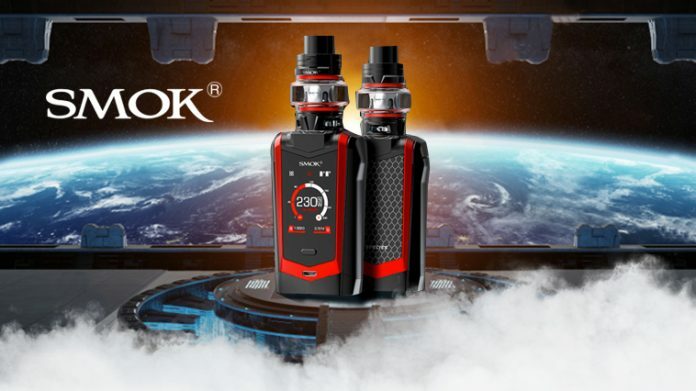 The SMOK Species V2 230W kit is not to be overlooked. With a 1.45-inch touch screen, navigating the menu is a breeze. The touch screen on the Species box mod is one of the easiest I’ve ever used on a mod. It’s highly responsive, so you won’t be getting frustrated like you might’ve with past touch screen mods. The color display is easy to read in any light. From the main screen, you can access the menu by clicking the top left corner. Here you will find your mode settings, as well as puff settings, screen settings (where you can choose one of six colors for your display) and system settings. The interface of the Species is super well-organized, so there will be little confusion when you first set your mod up. On the main screen you will also be able to see your dual battery life, whichever output mode you have selected, and the corresponding amount of wattage, temperature, voltage and so on that you are vaping. As mentioned previously, there is a lock button below the touch screen display. This is to lock the touch screen and prevent any accidental menu changes while you are vaping. The Species V2 is a high-powered, 230W dual 18650 mod. Like most of the newer dual-battery mods these days, the door is a slide to open, secure cover located on the bottom of the mod. 18650s fit securely in the device without much movement or rattling. The battery door is located on the bottom of the mod. The chipset that SMOK uses on the Species V2 is familiar to other SMOK mods, but it’s a faster, upgraded version. The mod’s firing time is quick and smooth, which is one of the best parts of the chipset, along with the capability of 1-230W, a full temperature control suite, manual TCR, and atomizer recognition. You also get the option of four different power settings: soft, normal, hard, and max. The SMOK Species 230W kit comes with the TFV8 Baby V2 tank. The TFV8 Baby V2 is a new, upgraded tank in the TFV8 and Baby family of SMOK tanks. This tank is smaller than the TVF12 Prince, but that doesn’t mean the performance suffers! In fact, the TFV8 Baby V2 tank is a surprising cloud beast. The compact size is a plus, and it integrates very well into the feel of the angular, but ergonomic, design of the Species V2 mod. Summing up the function of this tank? It’s pretty phenomenal. The flavor and vapor production from the TFV8 Baby V2 coils were impressive. Vaping with the 0.17ohm Baby V2 A1 (single) coil was the sweetest spot for me. The A1 is a larger surface area single mesh coil that works well anywhere from 90-140W. The flavor from the A1 was astonishingly good, even past 100W. I tried a few different juices to see how well the A1 took a change of liquid. I went from vaping Ruthless Vapor’s Slurricane—a fruity peach, papaya and guava blend—to a White Chocolate Mocha juice by Nitro’s Cold Brew Coffee. The mesh coil had no trouble transitioning e-liquids. Within a couple of minutes the fruit flavor had vanished and I was tasting nothing but coffee. Mesh coils last a bit longer than other coil options if used properly. After a week with the A1, I haven’t noticed any flavor degradation, or drop off in performance. I can see this coil working well into the second week. 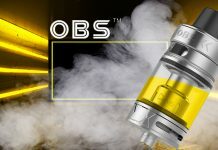 The other coil in the kit, the 0.2ohm Baby V2 A2 coil, is a dual mesh coil that produces enormous clouds (especially if you keep the airflow wide open) while also maintaining the flavor integrity. Compared to the SMOK coils of the past, these things are no joke. The newest mesh coil heads are incredible, plus they use antibacterial medical grade cotton and reduces the chance of bacteria buildup. I should probably mention that these coils not only vape wonderfully, but they also are available in different colors: standard silver, gold, and the 7-Color rainbow. 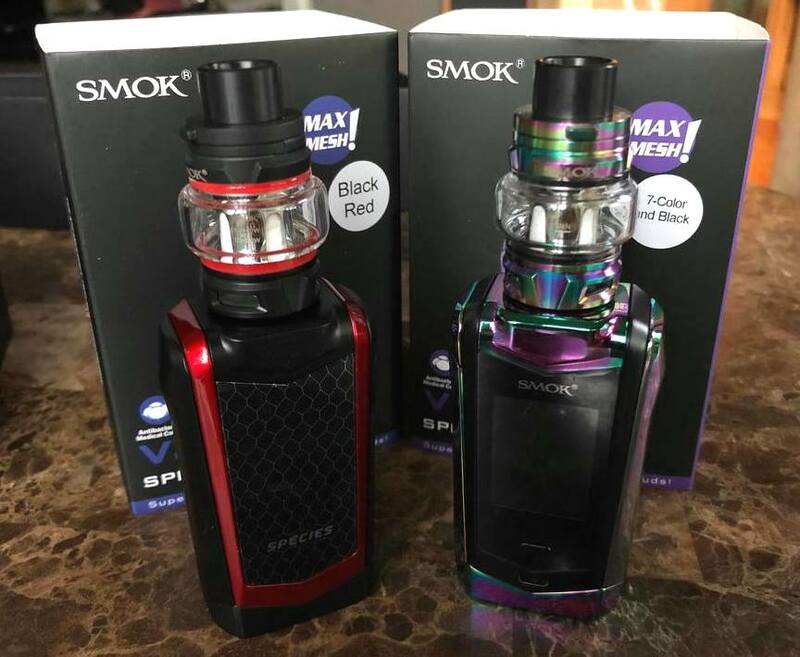 I have taken my time testing the SMOK Species V2 230W kit in different vaping modes, thinking that this kit may be best for vapers who usually vape in power mode. I have to say, though, that the Species V2 surprised me in more ways than one. The Species V2 mod and the TFV8 Baby V2 works very well with custom built coils in TC and TCR modes. I also really like the power settings and the option of vaping at max. The SMOK Species V2 230W kit is such a complete package on its own, and even if you prefer custom builds when you vape, I highly recommend the new Baby V2 mesh coils. I’ve tried different PG/VG ratios to see how the coils handled higher versus lower viscosity juices; the performance didn’t change. Remember though, that these mesh coils require a bit more time to break in. The full flavor quality is not present on a mesh coil right away — it takes a bit of time and usage. The Species V2 mod is easy to operate, has a responsive chipset, and nice touch screen capabilities. The strength of the mod combined with the TFV8 Baby V2 tank makes for a powerful kit that gives you an incredible all-day-vape experience. This kit is solid, well-built, comfortable, and functions extremely well for higher wattage vaping. With all of the pros, the SMOK Species V2 230W kit has easily climbed my list of top kits of this year. 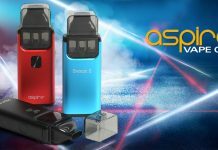 You can purchase the SMOK Species V2 230W Kit here.